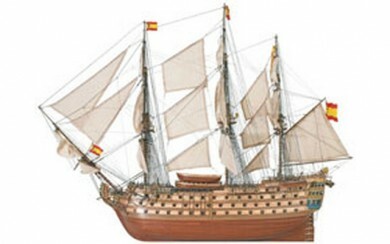 The Santa Ana was built at El Ferrol, Spain in 1784. She was a prototype of a series of 8 ships and carried 112 guns. In Trafalgar, 1805, she fought against the Royal Sovereign. After more than three hours with over 100 men killed, her rigging destroyed and surrounded by many British ships, she surrendered. But during the heavy storm that followed the battle, her crew seized her and the Santa Ana arrived at Cadiz.